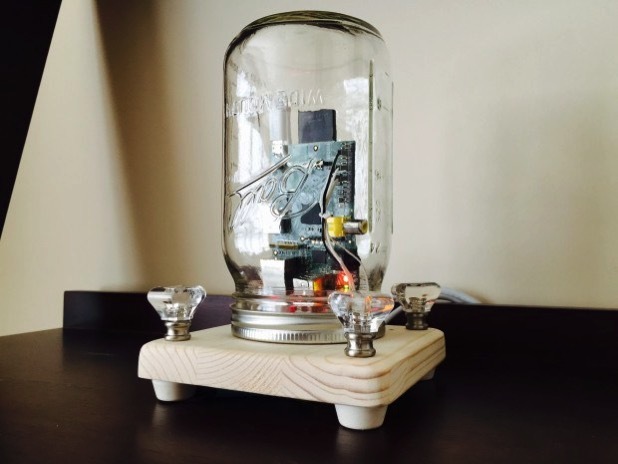 Preserve Data in a Mason Jar Using Raspberry Pi @Raspberry_Pi #piday #raspberrypi « Adafruit Industries – Makers, hackers, artists, designers and engineers! Just when you thought we had seen every possible use for the infamous Mason Jar, it strikes again! But seriously, this looks awesome. Living in the South I’ve had a lifelong fascination with Mason jars. They’re used to preserve everything and have a uniquely nostalgic aesthetic. Once I realized a Raspberry Pi would fit perfectly inside one, I decided the obvious use for it was preserving digital content. Having run BitTorrent Sync on a Raspberry Pi before, I knew it would be a stable platform to provide a synced backup of media from my MacBook and phone, and my wife’s MacBook and phone. In essence, we’d have a Mason jar that preserves our most cherished family memories: a Raspberry Preserve.